Liverpool maintained their unbeaten run at home as Jurgen Klopp's men defeated Burnley by a scoreline of 4-2. Liverpool started with a 4-3-3 formation. Adam Lallana started the match with Fabinho and Wijnaldum at the heart of midfield. 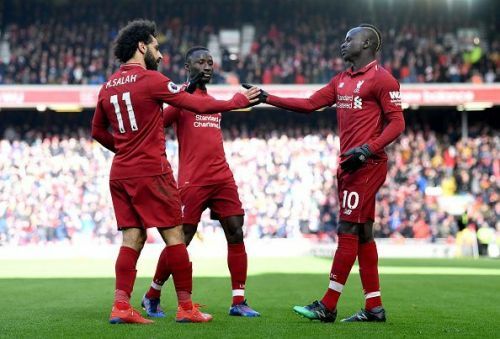 Sadio Mane and Mohammed Salah started another Premier League match alongside Brazilian Roberto Firmino. Burnley opened the scoreline at the sixth minute of the match. It was Ashley Westwood who grabbed the lead following a sweetly-taken corner. There was an alleged foul on Alisson during the set-piece, but the referee went on to award Burnley the goal. Not long later, Roberto Firmino scored the equaliser from a close range. Tarkowski failed to intercept Mohamed Salah's pass towards the centre of the box and Firmino did his job by flicking the ball into the net. Sadio Mane extended the lead for Liverpool at the 29th minute of the match. He was unmarked and his right-footed curler made it 2-1 for the home side at Anfield. Liverpool go into the break leading the match. In the second half, Firmino scored his second of the day at the 67th minute. The Reds look set to win all three points and exert further pressure on Manchester City. The drama between both sides was not over. During injury-time, Johann Gudmundsson helped Burnley to decrease Liverpool's advantage. His goal from the centre of the box secured the second goal for his side, making it 3-2. At last, Liverpool restored their two goals lead with Mane scoring a brace which was assisted by the substitute, Daniel Sturridge. Liverpool's defence failed to keep another clean sheet. Jurgen Klopp's men finished a high-quality match with a stunning 4-2 scoreline. Now, the Reds hold their second position having bagged 73 points from 30 EPL matches. On the other hand, Burnley are just above the relegation table with 30 points. In this match, Liverpool played well with fast attacking football. They now have an away match against Bayern Munich on Wednesday. Here is how fans reacted on Twitter to the game. Liverpool doing what they had to do. Reckon this title race is going to the last game of the season. Hope so.